Y’all I just have to tell you about my new toy. 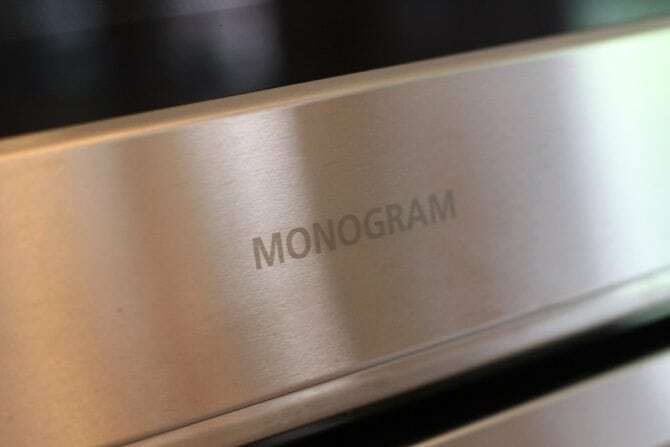 And when I say toy, I really mean my amazing new kitchen appliance – my new GE Monogram Advantium Oven. Let me back up a bit… You’ll probably remember me posting a few months ago about my trip to Louisville, Kentucky to the GE Appliances factory and the GE Monogram Experience Center with Christy from Southern Plate and Leah from AllSouth Appliance. We got to experience all of the amazing GE Monogram appliances that are being built right here in the USA. It literally blew my mind. Y’all, you can cook 4 baked potatoes in 10 minutes with the 240 convection model. It’s just crazy. And again, because of those halogen bulbs and convection, you get the tender flaky potato with the crispy skin too. And with hundreds of presets (you just tell it what you’re cooking and it walks you through) you literally can’t mess it up. As you can tell, I was really impressed with this and could imagine all kinds of uses for our family. With baseball, school, work, and everything else, I can use all the extra hands in the kitchen I can get. Some of the models cook things 8 times faster than a regular oven – I mean who couldn’t use some extra time these days? 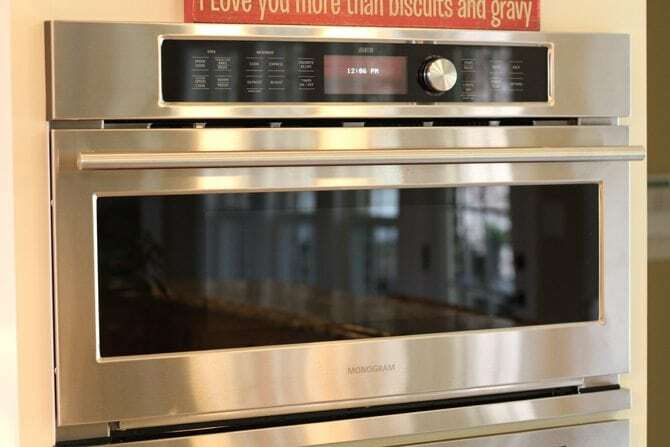 So, imagine my surprise when the folks at GE and GE Monogram called me up to tell me they were sending me an Advantium oven! You would’ve thought I had won the lottery! I got it installed a few weeks ago and I think I’ve used it every day since then. From softening butter and cream cheese, to popping popcorn, to making a quick Saturday lunch, to baking last night’s Poppyseed Chicken Casserole – it’s a real kitchen workhorse for me. 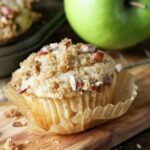 I also love how quickly it cooks muffins in the mornings – so much so, that I created a brand new recipe… Apple Cinnamon Crunch Muffins! 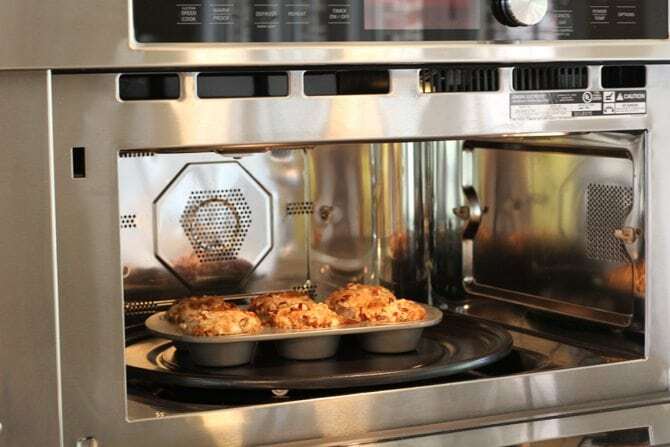 These things combine all my favorite flavors of fall and cook in the Advantium 240 in 9 whole minutes – that’s 11 minutes faster than my regular oven! Now, all those out there who don’t have an Avantium, no worries! I’ve got the standard recipe below as well. The crunchy topping on these is my favorite part. I just love the Cinnamon Crunch bagels at Panera and these have a similar flavored and textured topping. My family just loved them and I know you will too! Y’all enjoy! 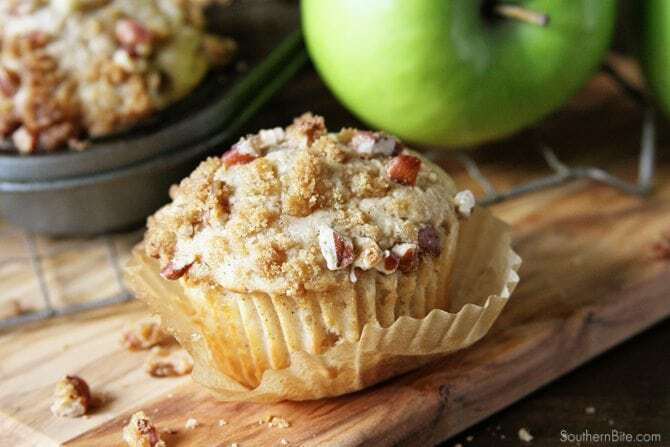 Place muffin liners in the wells of a muffin pan (if desired) or spray the muffin pan with nonstick cooking spray. In a medium bowl, whisk together the flour, sugar, and cinnamon. Add the milk, beaten egg, vanilla, and chopped apple. Stir until the ingredients are moistened, but don't over mix. Spoon the mixture into the muffin pan. Make the topping by combining the pecans, brown sugar, and melted butter. Mix with a fork until moistened. Spoon the mixture over the batter. Bake in the Advantium on the Metal Tray for 9 minutes at the settings below. These instructions are developed using a 240 GE Monogram Advantium Wall Oven with Convection. Preheat the oven to 375 °F. 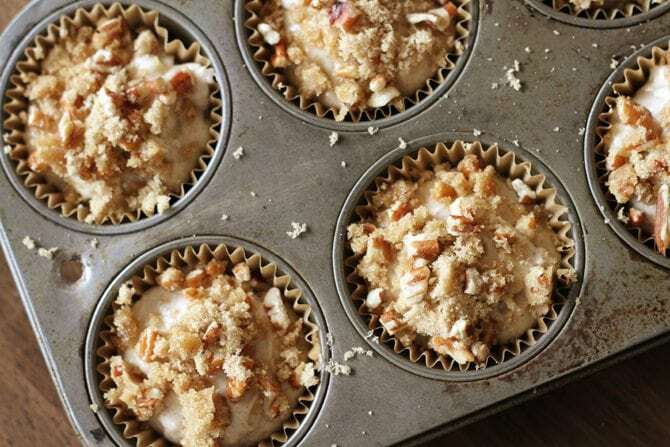 Place muffin liners in the wells of a muffin pan (if desired) or spray the muffin pan with nonstick cooking spray. In a medium bowl, whisk together the flour, sugar, and cinnamon. Add the milk, beaten egg, vanilla, and chopped apple. Stir until the ingredients are moistened, but don't over mix. Spoon the mixture into the muffin pan. Make the topping by combining the pecans, brown sugar, and melted butter. Mix with a fork until moistened. Spoon the mixture over the batter. Bake for 20 minutes or until golden brown and a toothpick inserted into the center of a muffin comes out clean. Holy cow, Stacey, color me JEALOUS! 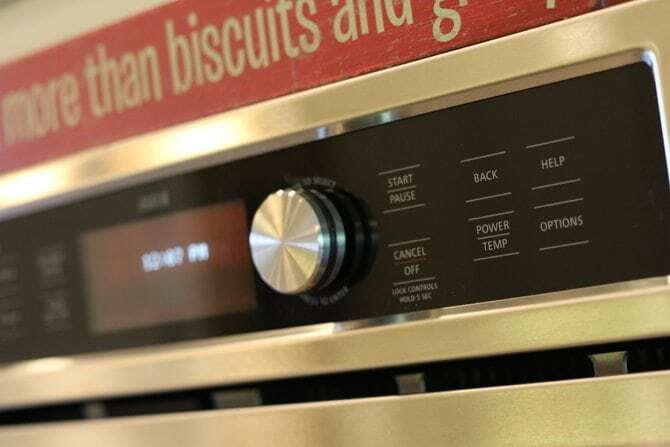 That oven looks and sounds amazing. I am in desperate need of a replacement for my microwave (the one appliance that isn’t stainless like all the others and the ONLY one that you can see in my YouTube videos…in all its ugly white glory in my black and grey kitchen!!!). Maybe I should take advantage of that Chattanooga delivery offer. 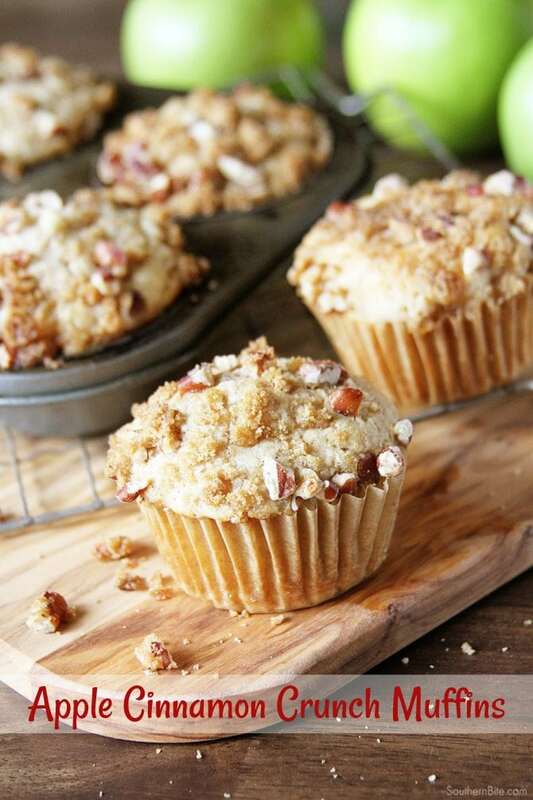 Oh, and your muffins look fantastic too! Thanks so much! I do loooove my Advantium. They’re a little expensive but are totally worth it if you can swing it. 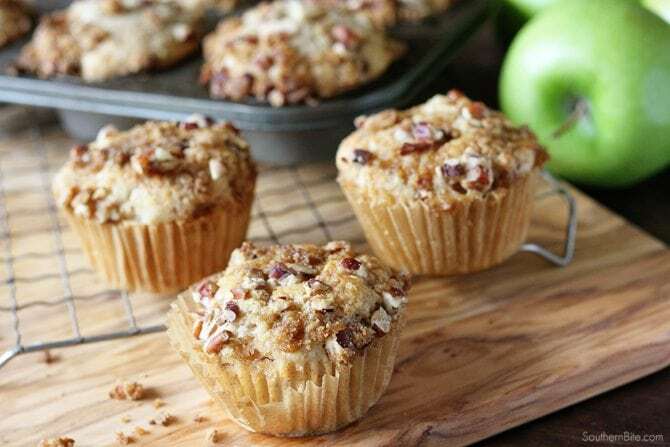 These muffins looks so delicious Stacey. I will be using this recipe this weekend. Oh yeah! Congrats! 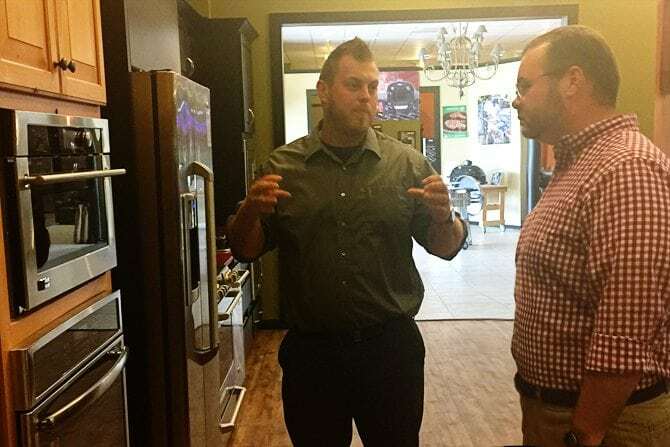 on your amazing new appliance. I am jealous. Thanks so much! I never imagined I would have something so nice! I don’t have self raising flour availabe. Can you let me know if I can just add baking powder and or soda to provide the needed boost to this yummy recipe? You did win the lottery. I just wish GE would send these type of items to the everyday person. Not bloggers, not professional chefs, just plain people. I purchased an Advantium 120 about 5 years ago. It does not have convection feature but the new GE range I purchased at the same time does. I really like the Advantium’s cooking but the front of the oven is white plastic instead of the stainless version you got. I paid close to $900.00 for it but in the last 6 to 9 months the face has developed a crack down the front of the door and GE says there is nothing they can do about it. Needless to say I am very dismayed. Oh no! I sure hate to hear that! I am one of the common people that don’t have one of those fancy ovens so to post a recipe without the baking temp is kind of cruel. please think about the rest of us. Good deal! You know I wouldn’t do that to ya! Excellent muffins; so moist and delicious the topping was great, just the muffins so much better! I had three small apples I needed to use and this was perfect. Thanks, Kristen! So great to hear! I had my own GE Experience Center Adventure and I LOVE, LOVE, LOVE my Advantium. How do you make the grilled cheese in the Advantium….they didn’t demo that for us and I really need that in my life.